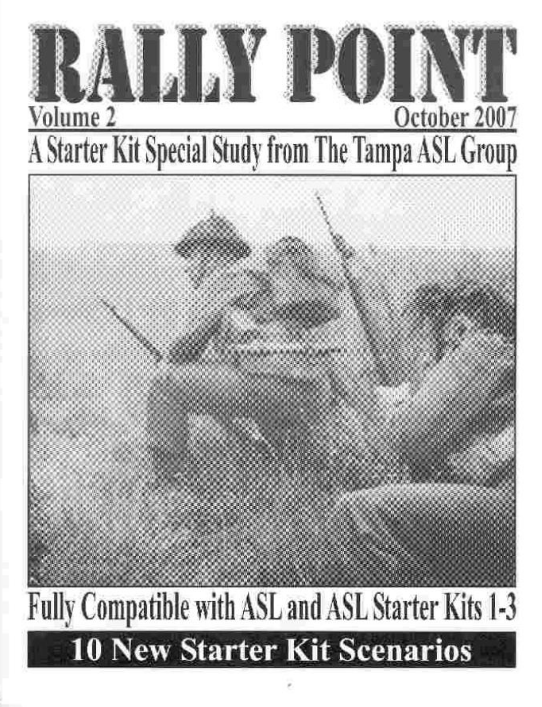 Rally Point Volume 2 is an ASL/ASL Starter Kit Compatible scenario pack from the Tampa ASL Group. Each scenario is fully compatible with full ASL rules and ASL Starter Kit Rules. These 10 scenarios were playtested with consideration for both rules sets and are presented in the Schwerpunkt easy-to-read format on high-quality cardstock. ASL players need boards t, u, v, w, x, y, and z to play these scenarios. ASL Starter Kit Players need Starter Kits 1, 2, and 3 to play the scenarios. This edition of Rally Point is intended to unite ASLers and ASL Starter Kit players through a common set of scenarios. A am playing ASL on Japan.Face to face only.this senario is playing CHiba region GAme circle on playing last month. My friend is playing RPT14 and ROPT17.Very fun. This module is ASLSK-OK,ASLstandard-OK.I am usualy play ASLstandard. this RPT14and17 convert myASLstandard life to ASLSK game playing.